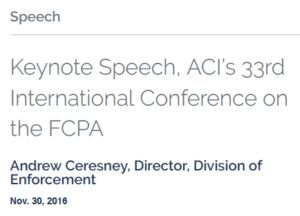 On November 30th, 2016, the Director of the SEC’s Division of Enforcement gave the keynote speech at the American Conference Institute’s 33rd International Conference on the Foreign Corrupt Practices Act (“FCPA”). Speaking for the fourth time as the Director of Enforcement, he announced that the past year was a record year for the SEC Foreign Corrupt Practices Act enforcement program. In his remarks, he referred to SEC whistleblower cases involving FCPA violations. The Director opened his speech by referring to the “tremendous amount” of progress that the SEC has made under the FCPA over the past four years. Among other things, he pointed out there were 21 SEC Foreign Corrupt Practices Act cases that the SEC brought against entities and individuals this year. He also stated that the SEC obtained hundreds of millions of dollars in financial remedies from FCPA violators. In his remarks, the Director drew a distinct contrast between companies that report their FCPA violations to the SEC themselves, who may receive lighter treatment as a result, with companies that say nothing until an SEC whistleblower case has been brought. According to the Director, where companies discovered misconduct and resolved not to report it to the SEC or provide meaningful cooperation with the SEC, the SEC did not provide leniency. Where the SEC learned of the conduct from other sources, such as through an SEC whistleblower case, the Commission has not given reductions in penalties or other benefits and, in some cases, even required the violator to pay significantly higher penalties as a result. If you believe you may have an SEC whistleblower case based on an FCPA violation and would like more information, please click here. If you want to find out more about other kinds of SEC whistleblower cases, you can click here.